Democrat presidential hopeful Elizabeth Warren, who hasn't officially declared her candidacy for the White House, issued an apology to the Cherokee Nation this week for her DNA test stunt. Hubbard did not reveal the contents of the letter Warren sent. In October 2018, Warren published the results of a DNA test which showed she might be 1/1024th Native American. She used this as "proof" she is Cherokee. She's actually a white woman, which we've known all along. Throughout her career Warren used her fake Cherokee status to get ahead. The Fordham Law Review deemed Warren Harvard Law School's "first woman of color," and she regularly listen herself as a minority for job recruiting purposes. A 1997 Fordham Law Review piece described her as Harvard Law School's "first woman of color," based, according to the notes at the bottom of the story, on a "telephone interview with Michael Chmura, News Director, Harvard Law (Aug. 6, 1996)." The mention was in the middle of a lengthy and heavily-annotated Fordham piece on diversity and affirmative action and women. The title of the piece, by Laura Padilla, was "Intersectionality and positionality: Situating women of color in the affirmative action dialogue." Further, Warren repeatedly told a story about her parents eloping because her mother was Cherokee. In other words, her racist grandparents wouldn't allow them to get married. 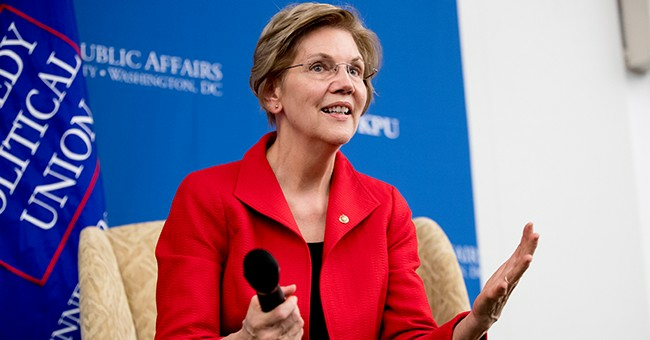 "My mom and dad were very much in love with each other and they wanted to get married and my father's parents said absolutely not because she's part Cherokee," Warren said. "It was an issue in our family." Warren's DNA stunt and the enormous backlash she received rattled advisors, who have been mulling this apology for months. In fact it was so bad her hometown newspaper, The Boston Globe, urged Warren to forgo a presidential run altogether. Warren has apologized to the Cherokee Nation. Now it's time to apologize to America.